Many of today’s cars are sold without a spare tire which causes some people to worry about what they would do if they were to have a flat. Let me see if I can convince you that you may rather go without that spare tire and hopefully “spare” you some anxiety. (Pun intended). In the early years of the horseless carriage or automobile, tire technology was new and tires not only wore out fast but they were not very dependable. It was pretty common for many cars to come equipped with not just one spare tire but two! Can you imagine driving 100 miles which would seem like a really long trip and needing to replace at least one tire and possibly two? Back then the roads were mostly unpaved so the combination of dirt roads and poor tire dependability necessitated at least one spare tire. Fast forward 80+ years to today. Tire technology is pretty unbelievable. If you keep good tires on your vehicle and especially if it comes equipped with TPMS (tire pressure monitoring system) which is on most cars and trucks built within the last decade, and you pay attention to it’s warnings, the chance of a flat tire while driving is really pretty minimal. 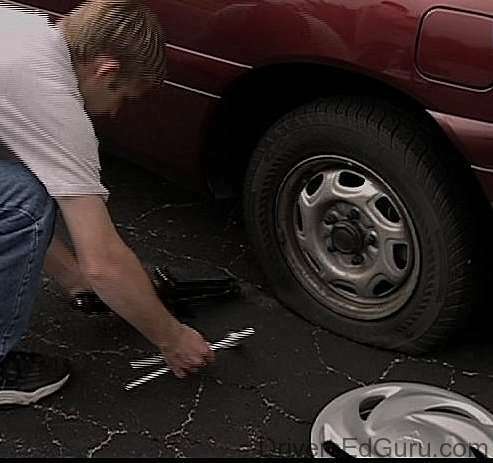 I’m not talking about coming out to your car in the morning or after work or any time it has been sitting a while and finding that one of your tires went flat. For those times the spare tire-less vehicles that I’ve seen come equipped with a mini air compressor that can be used to inflate the low or flat tire so you can drive it somewhere to be repaired or replaced. Here are more reasons I feel a spare tire is unnecessary. With all the expensive advances engineers have made to reduce weight for better efficiency and gas savings, we then carry around a heavy spare tire, jack, lug wrench etc. That adds many pounds of unused weight and they take up valuable space usually inside the vehicle or in the trunk. We have found numerous times while doing an oil service and vehicle inspection that the spare tire that’s being carried around is flat! Another reason many cars have no spare tire is the fact that tire sizes used on today’s vehicles are much larger than they used to be which many times makes them just too big to carry in smaller cars or sports cars that have small trunks. On pickup trucks and SUVS that are driven in areas where salt is used on the streets in the winters generally carry their spare tire underneath in the rear of the vehicle where the road salt spray hits them. Many times the winch that holds the spare tire in place becomes so rusty that there is no way to lower the spare tire if it were needed without special tools to cut the winch loose. We have cut numerous winches apart because they have become rusted so badly there wasn’t any other option. The last reason I’m not sure of the “need” of a spare tire is many people are not educated on changing a tire or using a jack so there are some real safety concerns from the vehicle falling off the jack to someone not tightening the spare tire properly and having it come loose or off the vehicle with the potential to cause serious personal injury. With pretty much everyone having a cell phone today and roadside assistance so readily available, I think it would be better for most people to make a call and let a professional come and repair or replace the tire.